There is a chapel at Churchill College, but no chapel of Churchill College. The preposition denotes a truce after a battle, a donnish compromise. It was a device by which those who passionately wanted a chapel, and those who passionately did not, could live together. For when the College was launched in 1960, the dons fell into embittered controversy. The Christians said the college must have a chapel. The atheists said that in the mid twentieth century an institution of higher education, dedicated to science and technology, had no business supporting superstition. The Revd Timothy Beaumont (Lord Beaumont) set the cat among the pigeons by offering to pay for a chapel. Francis Crick, the 1962 Nobel Prize-winning discoverer of the structure of DNA with James Watson, resigned his fellowship in protest. But the Christians were passionate too. The 1950s witnessed the last revival of British Christianity; universities saw their role as moral guardians; it was not long since Oxbridge colleges expected students to attend chapel. The Senior Tutor, a classicist, pronounced, ‘I cannot be Senior Tutor in a college which does not profess and call itself Christian’. Finally, a deal was reached. The College would lease a plot of land, at the far corner of the 40 acre site, to a Chapel Trust, to consist of those fellows who wanted a chapel. And so a chapel was built, in 1967. The architect, Richard Sheppard, had included a chapel in his original scheme, and placed it beside the College entrance. Today the gap remains. What instead catches the eye is the majesty of the squash courts, sheer cliffs of brick, and Sheppard’s Brutalist boiler-house ducts, all chunky expressive concrete. Emerging from the far side of the College, visitors see, across the playing fields, 500 yards away, a small building and ask, ‘What’s that’? For what they see is not obviously a chapel. Its architecture was vitally, if coincidentally, affected by the great chapel row. Had the chapel been built in 1960, it would have had a conventional rectangular plan. But the delay, and the opportunity of a freestanding building, allowed a total rethink. What intervened was the arrival of the ‘liturgical revolution’. The new mode was for centrally-oriented churches, circular, fan-shaped, or, as here, square. The congregation is brought into intimate relationship with the altar. Between Basil Spence’s Coventry Cathedral (1956-62), with its traditional nave, and Frederick Gibberd’s circular Liverpool Cathedral (‘Paddy’s wigwam’) (1962-7), there lay a transformation. Especially influential were Maguire and Murray’s St Paul’s Church, Bow Common (1958-60) and Peter Hammond’s Liturgy and Architecture (1960). 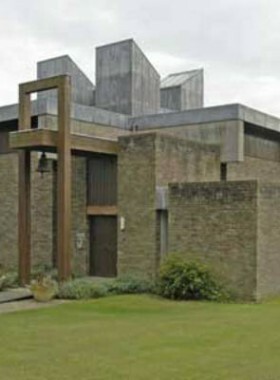 The Churchill chapel is a modern interpretation of a Byzantine basilica, a Greek cross marked out in concrete beams. The roof is of timber, with a central lantern. Externally, the dominant features are the four massive concrete members, deliberately over-scaled. The construction echoes the concrete-and-brick idiom of the College. The brick is exposed internally. 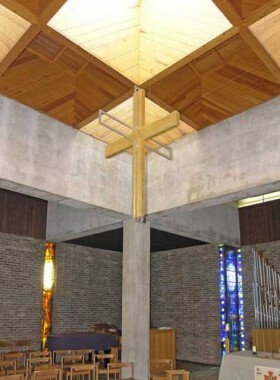 Over the altar hangs a three-dimensional cross, designed by Keith Thyssen. The chapel is dark, and the sights and sounds of the outside world scarcely enter. There is a feeling of withdrawal and stillness. 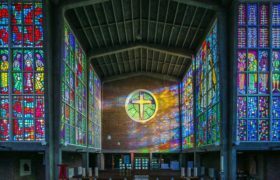 The eight narrow vertical slit windows are filled with stained glass by John Piper. Their shafts of blue, mauve, gold, and green light are the glory of the building. 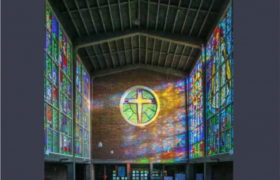 Sheppard’s gem of a chapel celebrates its fortieth birthday this October. Architecture: the Churchill Competition’, which explores the competing schemes for the college in 1959. Elain Harwood has called it ‘the most important architectural competition since the war.’ This exhibition is organised by Barry Phipps in conjunction with Dr Mark Goldie, whose book accompanies the exhibition.